Marinate bonelss pork loin in honey, rice wine vinegar, cilantro and ginger, then brown and create a vegetable and gravy sauce to pour over pasta. From kitchen to table in 1 1/2 hours (includes time to marinade). Chop cilantro and place in a container with a tight lid. Add grated ginger, rice wine vinegar and honey. Stir to mix. Put pork chops into container, seal and shake vigorously to evenly coat marinade over meat. Place in refrigerator and allow to marinade for at least one hour. Shake and turn two or three times during marinading to keep all the meat covered. Heat water in a large pot on boiling for pasta. Pour sesame oil into a skillet and turn heat on to medium. Remove pork chops from marinade, but reserve liquid. Brown pork chops in hot oil until no longer pink in the middle, turning halfway during cooking time. While meat browns, crush and mince garlic. Remove meat from skillet and set aside, covered. Brown garlic in meat skillet and then add liquid from marinade. Dissolve cornstarch in water and add to skillet, turn heat up to medium-high, cook and stir for two minutes. Add frozen vegetables and reduce heat to medium-low. Cook pasta in boiling water according to package instructions. Drain and rinse. Turn heat under skillet back up to medium high and cook while stirring until sauce is thickened. 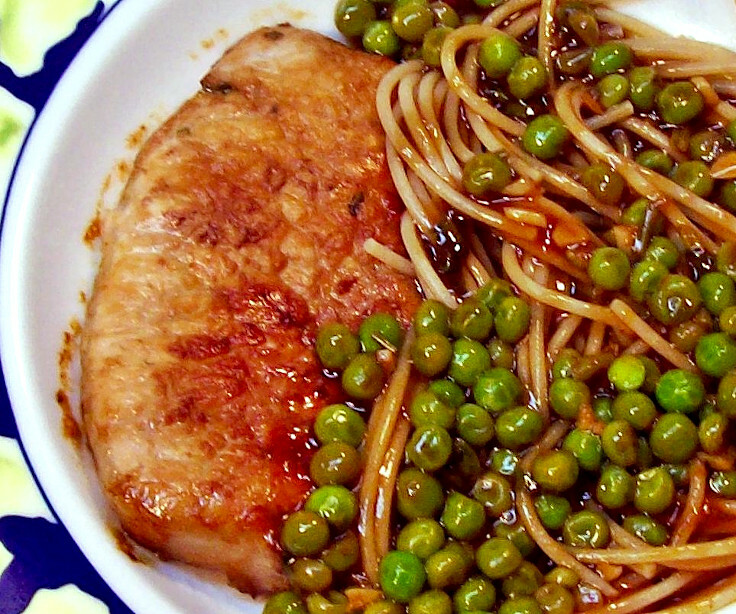 Pour over pasta and serve with pork loin chops.